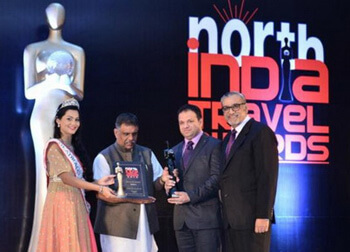 India Travel Awards : The travel and hospitality industry gather at Hyatt Regency Gurgaon on October 21, 2016, to honour the movers and shakers in the region. The award is recognition of our hard work and is an achivement for the entire work force which puts in their heart and soul inmaking rail journeys so essential to travel experience, The testimony for our clients explains our credibility and our professionalism in business, "says Manish Saini, Director, Worldwide Rail Journeys. Saini further informs the company is focusing on charter service and is also planning to launch India On Wheels ehich will showcase the entirety of India's best tourism offering on a rail journey. "By next year we may also introduced Specific Religious Tours which will showcase various religious destination on a rail journey." adds Saini.